I like looking at Winter - snow enveloping familiar landmarks and creating a quiet atmosphere, dark branches silhouetted against frosty blue skies, winter sunrises and sunsets - but I don't much like the cold. This winter in particular, my hands have been suffering a lot thanks to Raynaud's Syndrome, which I have had since I was fourteen. 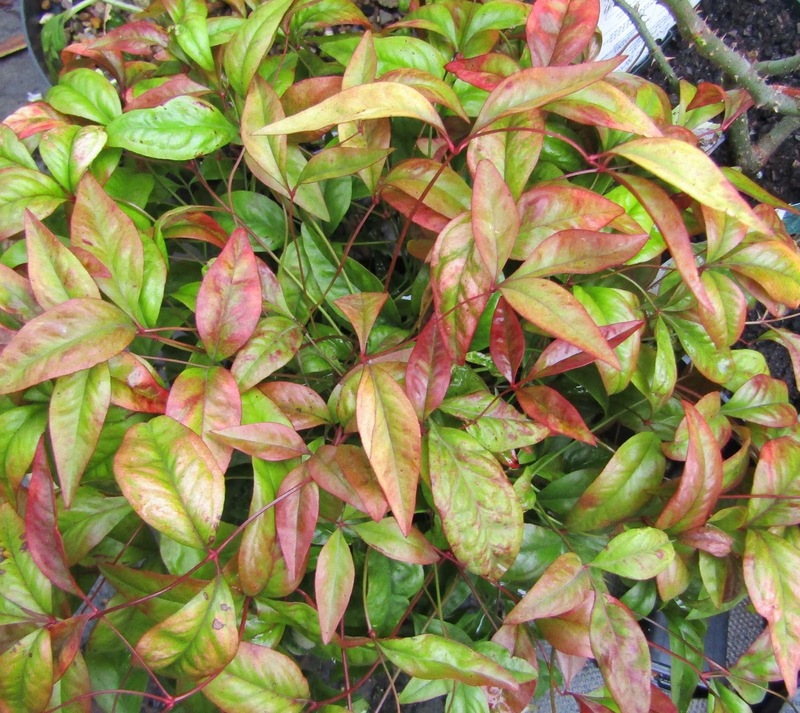 It is where extremities are ultra sensitive to temperature and the blood vessels constrict, cutting off circulation. My fingers go white and numb and I then have to work at getting the circulation going again. 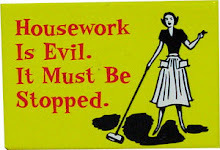 Irritating and sometimes painful, but not life threatening, I am pleased to say. 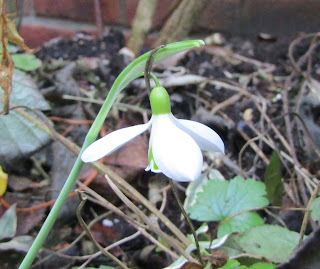 I am always cheered by the sight of snowdrops and other winter flowering bulbs. 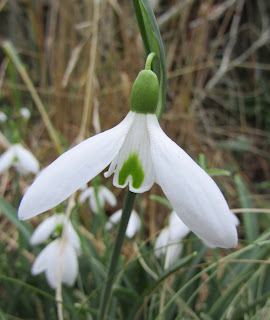 My snowdrops in the garden are starting to flower and are a sign that winter will soon be over. 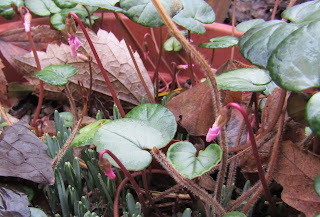 Cyclamen coum will be flowering next month, but the buds are preparing themselves. As I have mentioned before (just once or twice), snowdrops are one of my favourite flowers as their delicacy belies their inbuilt toughness. They don't seem to be worried by the winter weather. 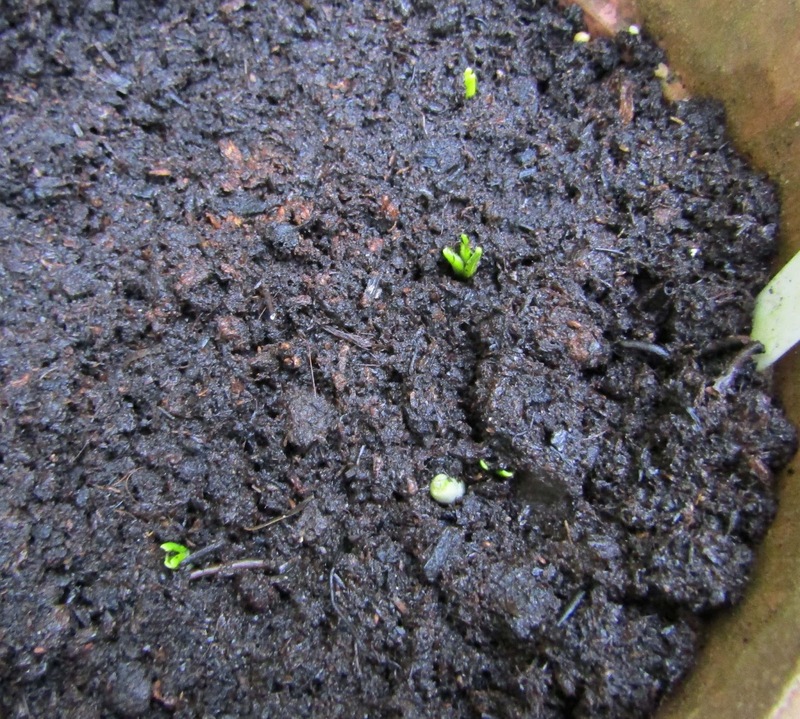 I noticed more signs of life with the tips of some crocuses just starting to show above the extremely soggy soil - you can tell that it has been very wet! I always want to add more colour to the winter garden and decided that I needed this plant; 'Nandina Domestica Firepower', which is a small shrub with lovely autumn and winter leaf colour, and white flowers in Spring. 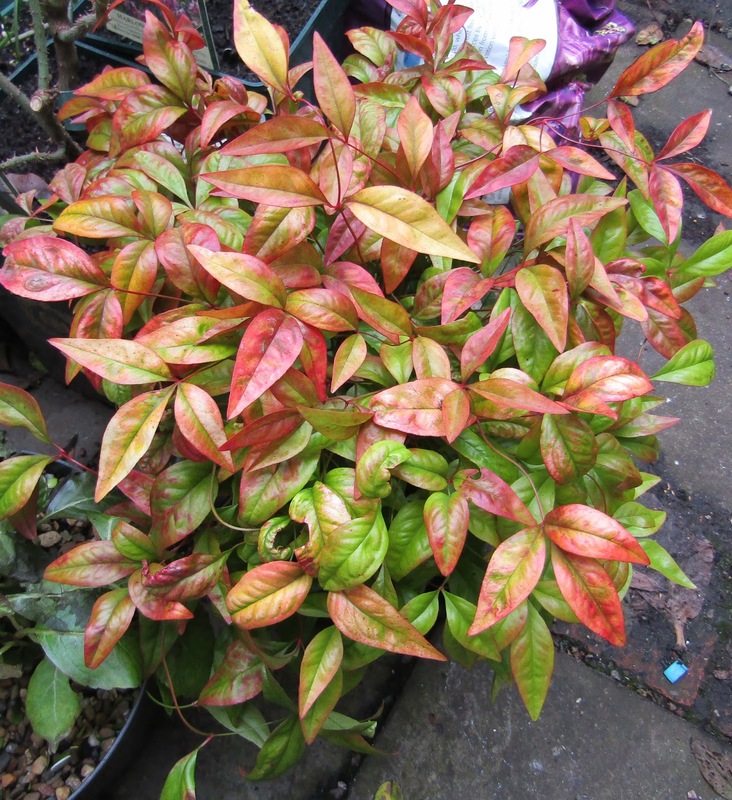 I was sorry to hear on last week's 'Gardeners' Question Time' (Radio 4) that Chris Beardshaw does not like Nandinas and rather dismissed them. 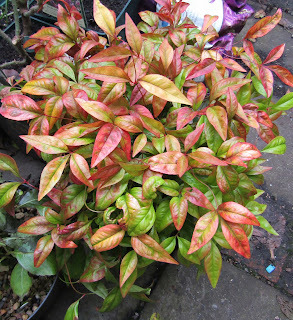 I shall enjoy my little plant, which has already given me a lot of pleasure through the dull winter weather. We have a much colder winter this year in Japan. I found one flower in our garden at the end of the last year and I was so exited. 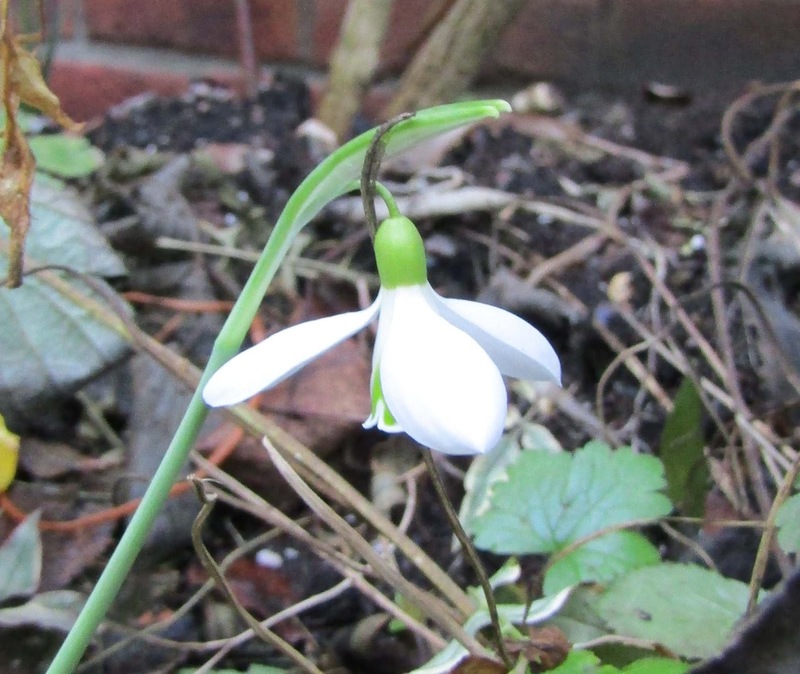 Now other snowdrops are starting to bloom. In addition, I found tips of leaves of English bluebell! I feel the spring is coming. Thanks, Poirot. Your garden seems to be much further on than mine here in the UK. It has been very wet this winter so far. Snowdrops are wonderful for bringing some much needed cheer, aren't they? I have some bluebells in a pot and they are starting to grow too. Spring is just round the corner. Thanks, Chrissie. I love to see the daffodils too, they are so bright and cheerful.